Is it bad that I didn’t get out of bed before noon this weekend? That hasn’t happened in years! Like, since high school. While I do feel slightly guilty about my laziness this weekend, it was awesome. Despite already having had 1.5 weeks of not working, it was nice to just relax and enjoy some leisurely time. Also, it snowed Friday night so Saturday was really perfect for drinking tea and knitting my sweater (and taking 3 months worth of recycling to the recycling center…). Before the lazy weekend completely commenced, we had a fantastic party on Friday night (is that bragging? I had fun, so I count it as a success!). I made some spinach-artichoke dip which I could NOT separate myself from. I’m an addict. Have you ever met anyone who DIDN’T like spinach artichoke dip? I haven’t, and I think anyone who claims they don’t like it probably just needs to try again. It’s just SO good! Tangy, salty, zesty, sometimes spicy – I’m not sure a dip could get any better. But this post isn’t about the dip (which will come soon! ): it’s about making pasta TASTE like the dip without having to put in nearly as much time. 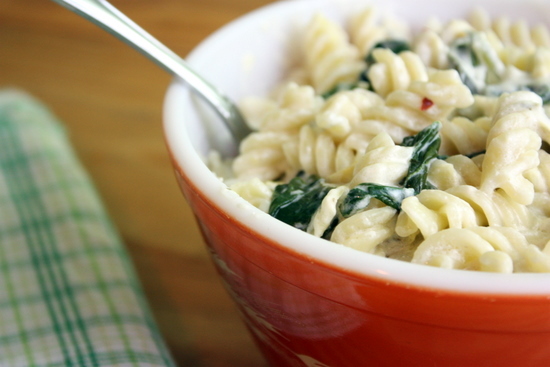 This pasta is super easy to make, doesn’t take long at all, and turns out a rich and creamy pasta. This is by no means a healthy dinner, but you could make a few substitutions to improve the health stats here. 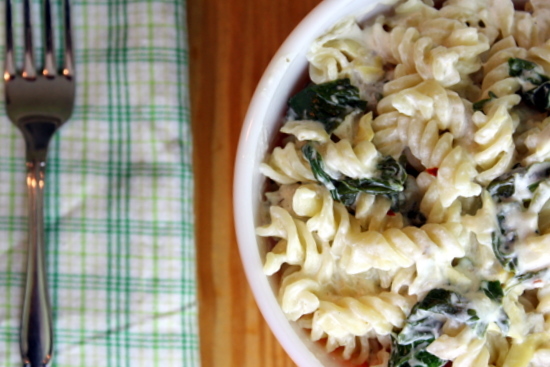 A fresh, clean, and brightly flavored pasta dish with a creamy cheese base. Bring water to a boil, add pasta, cook until done, drain and return to pot. Meanwhile, in a sauce pan, melt butter and add minced garlic. Cook 30 seconds before adding cream cheese. Wait for cream cheese to melt before adding milk and sour cream. Stir until incorporated. Add lemon juice, salt, red pepper flakes, artichoke hearts, and spinach. Add parmesan and cook until melted. Pour sauce over pasta and toss to coat. Serve with fresh ground pepper and parmesan!